It is Kristina Seise second year as a Kindergarten teacher here at DWCA. She has previously worked with both children with special needs from ages 5-21 and school aged children as well. 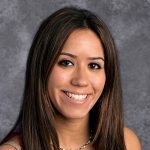 Kristina attended St. John’s University for her undergraduate degree in Psychology and continued with her Masters in Early Childhood Special and General Education. As an educator, she believes in teaching children with various tools and methods that will help guide them to success. Kristina looks forward to this year at DWCA!